I was a little worried about whether this would work when I first decided to make this and even more concerned about whether my husband would like this recipe. Thankfully it worked well and he loved it, so much so that when I said I was considering making it again the following day he said he would love to have it again which goes to show it’s pretty good. As an added bonus even Mr Squishy approves which is great as the more that can eat the same meal the better. This is a low carb dish that is not only delicious but also quick and super simple to make. First of all you will need a spiralizer to make this. I got mine from UK Juicers and have made another great recipe with it including my Crispy Duck, Hoisin and Cucumber Salad. (Hurry on over to that post as I have a giveaway for one lucky reader to win one of these super spiralisers!!!!) Should I let slip I have another fab recipe too come, just keep it between us for the moment though!!!!! This is a great gadget and is well priced as it is very sturdy and leaves very little waste. Courgetti is a great pasta substitute as it contains far less calories and you don’t have the worry of gluten that quite a few people are allergic to. This alternative to conventional spaghetti carbonara is not only much healthier it has the added benefits from the vitamins and minerals found in courgette. Spiralise your courgettes using the small spiralising blade that comes in the box. Set the courgette aside and remove as much fat from the bacon as possible, cut into small pieces and pan fry in a little olive oil until cooked well. Chop the onion and garlic and pan fry in a little olive oil. Grate the cheese plus the extra. Separate the eggs yolks in one bowl and white in the other. In the bowl with the yolks add the cream and give it a stir. You can save the egg white for a pavola or egg white omelette or scrambled eggs. Add about 1.5tbs of olive into a heated pan, toss in the courgetti and cook for a few minutes until it softens slightly. Add in the bacon, onion, garlic and pour over the egg and cream mix and the cheese (not the extra) and stir well. Add some salt and pepper to taste. Separate between two bowls and then add a sprinkle of the extra cheese on top. Serve fast whilst it’s still hot. This looks delicious! Spaghetti carbonara is a favourite – so this might be a healthier alternative! A great dish to cut down on carbohydrates. Looks delicious, I must get a spiraliser. I quite like courgetti spaghetti!! What a great alternative to pasta! I am sure I would like this dish. Looks very tasty. It is really lovely and easy to make too. This does the trick, Mr Squishy loves it! I would love this, I have to give it a try!! 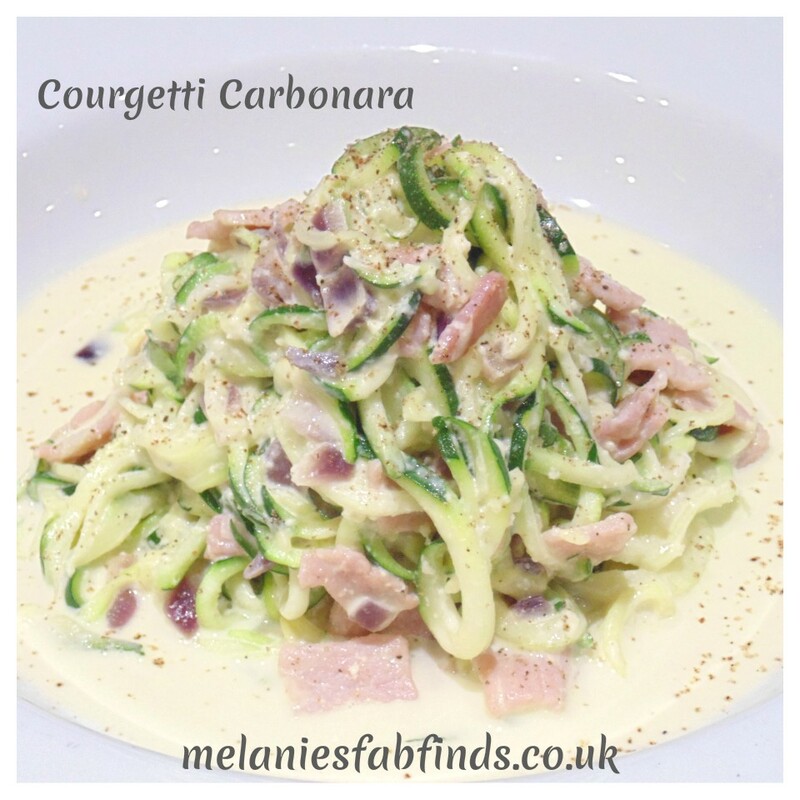 I love courgetti and carbonara so I need to try this – it looks delicious. That’s a shame but I am sure you can adapt it. It sure is a great way to cut down carbs and still enjoy these types of meals. I love it! I have made this before and love it – the kids love it too! This sounds really tasty but also looks really bright and cheery. Looks very tasty and healthy. I should really use my spiralizer more! This sounds so great and easy to do, too, thank you. That’s the beauty of it and it tastes yummy. Yum! What a great way to make a bit of a naughty treat meal healthier! It works really well. Give it a try you will be surprised at how nice it is. This sounds lovely, we don’t eat a lot of courgette, not sure why coz I love it! This a great looking recipe and looks nice and healthy. This looks great and I often have all those ingredients in stock! This looks delicious i need to try it! Lovely dish that looks good enough to eat, and we love pasta. This is a great alternative and much healthier. It looks delicious! I’m going to get a spiraliser; I do like vegetables, but I still find it difficult to get the right proportion of them in a meal and I think it would really help. looks lovely … shame that I can’t bear the taste of courgettes … Is the slimy sensation still there when you spiralise them ?? Mine would never look as scrummy as yours lol! You would be amazed at how easy it is, give it a try. Tried it last night!! WOW!!!!!!!! easy, yummy, and, lower in calories then pasta!! amazing!! what a fantastic idea I never would of thought you could have a pasta alternative, thank you for this post. I often eat Carbonara but I had never thought of the courgette angle. A cracking dish !